David Cowan Dobson (1894–1980), referred to as 'Cowan' Dobson ARBA (1919), RBA (1922), was a leading Scottish portrait artist of his day. Dobson was born in Bradford, Yorkshire, the second son of the Scottish portrait painter Henry John Dobson (1858–1928). Dobson started his career in Scotland. He was educated at George Watson's College in Edinburgh and studied art in Edinburgh, London and Paris. In 1918 he was using his father's studio at Dalry. Around 1920 he moved to London and from then on he worked and resided mainly in London. Occasionally, he would work in and around Glasgow. He is said to have rented Kenmure Castle, in New Galloway, Kirkcudbrightshire, in the 1930s and 1940s to entertain and paint fashionable sitters. Dobson mainly worked in oils but also painted some fine water-colour scenes. He painted in the tradition of the academic nineteenth century with mostly a rather darker colour scheme, while his brother Henry, influenced by the Modernist movement in Edinburgh, painted more colourful portraits. 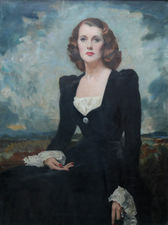 Although he painted some fine portraits of well known men, like Earl Attlee, Earl Beatty and Harold Wilson, Dobson also portrayed "fashionable London ladies". Dobson was married to Phyllis Bowyer, who was the brains behind his financial success. She made Dobson one of London's leading society portrait painters. She herself sat for the photographer Alexander Bassano, the resulting portrait now being at the National Portrait Gallery, London. During World War I, Dobson was commissioned by the Royal Air Force section of the Imperial War Museum to paint portraits of three recipients of the Victoria Cross. Dobson painted portraits of Lt. Col. L.W. Brabazon Rees, Sgt Mottershead and Flight Lt. A.W. Beauchamps-Proctor. Dobson first exhibited at Royal Academy when aged only nineteen and began showing at the Royal Scottish Academy four years later. 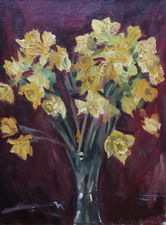 Dobson's works were also exhibited at the Royal Society of Arts, Royal Society of Water-colourers, Royal Society of Portrait Painters, Royal Society of British Artists, Royal Cambrian Academy, Fine Art Society and at the Walker Art Gallery in Liverpool.